These tasty little snack sized treats embody all the crispness of a cucumber with a lime like freshness. Mouse Melon vines enjoy a fertile soil so prepare your planting area by enriching the soil with compost, roughly digging a generous amount into each spot where you intend to plant, water in well. Mouse Melon seed can be sown directly into your EcoWise Planter, however as it takes up to four weeks to germinate, prefers warm soil temperatures to get started and slows down fruit production in the hottest weather so it is best to get a head start indoors. In a peat pot or larger sized soil block, sow two Mouse Melon seeds in pre-moistened seed raising mix pointed end down at a depth of 1.5cm, back fill over the hole and water from the bottom. 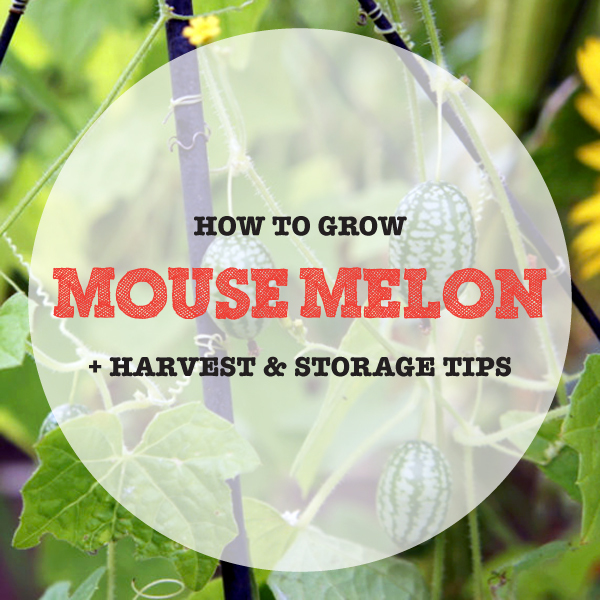 Start your Mouse Melon seeds 1-2 months prior to planting outside. Check the Bureau of Meteorology for the last frost date in your area, after the frost has passed and daytime temperatures are sitting around 21° C or more and nights are no lower than 10° C transplant your Mouse Melons plants approximately 15-20cm apart. As they are high-yielding vines they will require access to strong supports such as a couple of tall wooden obelisks, bamboo tepee, wire fencing or lattice trellis. Vines may take a little while to get going but once they take off it won’t be long until they are thriving and supplying an abundance of delicious fruit. Every 3-4 weeks liquid feed, Seasol, compost tea or diluted worm juice are all excellent options. Depending on your intention of use, Mouse Melons may be harvested at various stages of growth after 8-10 weeks, to remove from the vine pinch them off with your fingers or cut them off with a sharp knife or scissors. When grape sized Mouse Melons are crisp and delicious for fresh eating, especially straight off the vine although they may be refrigerated for up to 3 days or longer when wrapped in a cotton tea towel. Be sure to store them separately from tomatoes, bananas and melons. For fruit that are 2.5cm and bigger pickling is preferred and offers a solution to eating your harvest over a longer period of time.